Prevent texting and driving, now! By now, most of us know the dangers of texting and driving. Texting and driving, as well as other forms of distracted driving, accounts for a large portion of the accidents caused on New Mexico roadways. Putting the cell phone down while operating a vehicle can protect your life as well as another’s. DriveMode from AT&T is a free app that you can download. While in use, the app silences messaging texts, e-mails and incoming calls. It even sends the caller a text letting them know that you’re on the phone. Pretty cool, right? Other carriers offer a similar app, in case you don’t have AT&T. DriveSafe.ly for Blackberry or iPhone is another. The app functions similarly to DriveMode from AT&T. If you own an iPhone, you can get Siri to limit your function while driving. DriveScribe is an app for younger drivers that can be downloaded to any smart phone. When in “Driver Mode”, the app blocks all incoming calls, advises the driver on the speed limit and upcoming stop signs. It’ll even tell the driver to slow down if they travel too fast. Breathe a sigh of relief, parents everywhere. 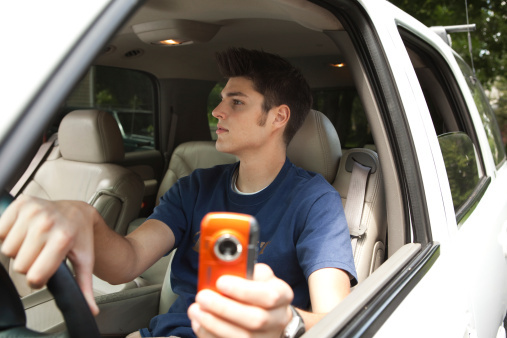 OneProtectis the most effective app for parents worried about their teen drivers. This app can be installed on any smart phone. The remote activation function allows parents to initiate the app from wherever they are and will not let the driver deactivate it. There are a bunch of other great apps out there to help with texting and driving cessation. What apps do you and your family use? Comment on our Facebook page or tweet us at @MVDExpress with your answer!